HI – Just a reminder that ScriptReadEast is taking place this Sunday 1st July – Details below but we hope you can make it along. 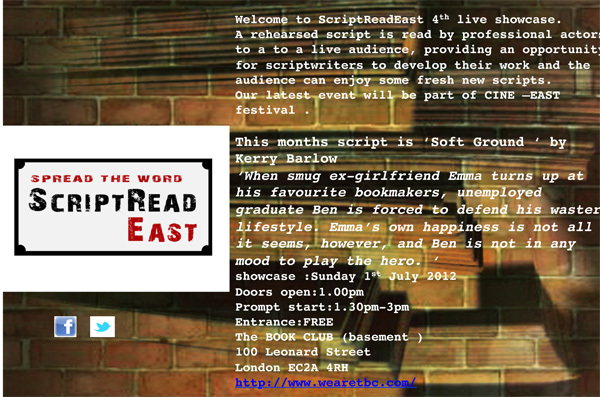 We have our 4th , yes our 4th SCRIPTREADEAST LIVE SHOWCASE – where our brilliant actors from our SCRIPTREADEAST actors pool have been cast , and rehearsed to read a brilliant theatre script ‘SOFT GROUND’ by writer KERRY BARLOW . ‘When smug ex-girlfriend Emma turns up at his favourite bookmakers, unemployed graduate Ben is forced to defend his waster lifestyle. Emma’s own happiness is not all it seems, however, and Ben is not in any mood to play the hero. ‘! We are delighted to be part of CINE-EAST 1 DAY FESTIVAL down in Shoreditch East London. Come and join us – Entrance is FREE – and apparently there will be some nibbles !! 100 Leonard Street ! London EC2A 4RH ! http://www.wearetbc.com/! PLEASE SPREAD THE WORD AND FORWARD THIS EMAIL / FLYA TO ALL FRIENDS AND COLLEAGUES WHO ARE INTERESTED IN WRITNG SCRIPTS, HEARING FROM NEW WRITERS, ACTORS , PRODUCERS , CASTING AGENTS AND EVERYONE ELSE – great start to a Sunday ..
We have a ScriptReadEast coming up on Sunday 1st July. We will have more details as they come in but this one promises to be the best yet. If you don’t already then please do follow us on twitter for the latest updates too.